The 228 Legacy is listed among other amazing self-published titles. Find me on Miami mystery writer R.V. Reyes’ blog talking about Robot Revenge. The 228 Legacy is mentioned alongside a stellar list of great #ownvoices literature. Dragonfly Dreams is mentioned in Teen Vogue! Humbled that Dragonfly Dreams is listed among other great Asian-led books that deserve movie adaptations. My new cozy mystery series is mentioned in two newsletters! A “Welcome to BookEnds Literary Agency” interview for me! Questions about Dragonfly Dreams from another award-winning multicultural author, Eleanor Parker Sapia. Interviewed on AndiLit.com about how and why I write. Featured on blog featuring interesting work APIs do around the world. Review: “A really good first effort to start this series.” Also my guest post about escaping to a mystery writers’ convention and a giveaway. My article, “Our Life Stories Matter,” is featured in the magazine. My article, “Inspired by Taiwan,” is featured in the magazine on page 20. An excerpt from a day in the life with Winston Wong. A spotlight on Seniors Sleuth. An author interview conducted by librarian Joy Weese Moll, plus a book review of Seniors Sleuth. Interviewed by J. David Core on The Lupa Schwartz Mysteries Blog. Post about The 228 Legacy written by Mr. Oo Tiongsiong, Chief Editor for Taiwanese Literature Battlefront. Profiled on website about how I balance writing and mothering. Mentioned in their blog post about 228. Q & A with tidbits about inspiration for my novel and my tagline. 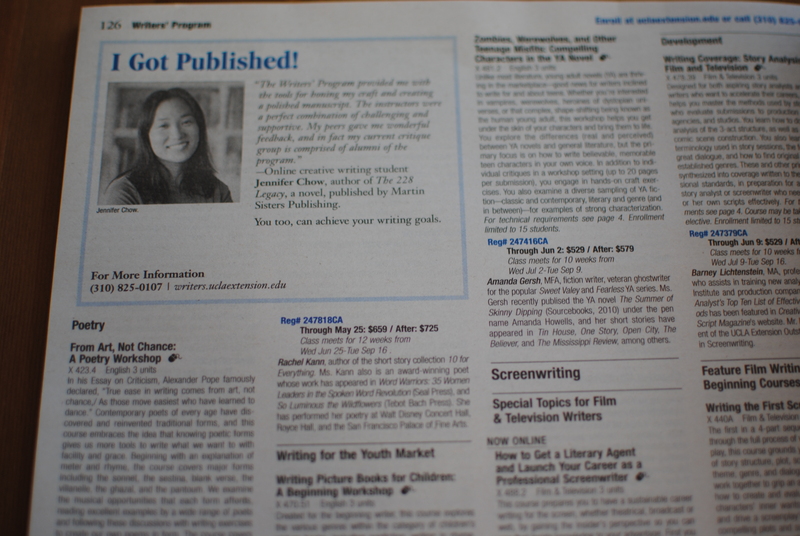 Featured in the “I Got Published!” section. A discussion of my book as it relates to aging issues, like loss of identity, deteriorating health, and caregiver burden. The 228 Legacy is a finalist in the multicultural category! Why I broke Asian stereotypes, the interweaving of faith, and more! A formal explanation of the event that inspired my book, alongside my author interview. Called an “Author of Reconciliation” in their magazine. “Chow neatly weaves the lives of her characters…” A review of my novel in the regional publication that’s been called “The Voice of Pennsylvania” by BBC News (on pg. 26, 33). My book listed alongside other Cornell authors’ works. Listen to the podcast (click on link above). Featured as a success story on the UCLA Extension blog. My book launch and novel described in Chinese. More on my experience as a writer and the publishing process. 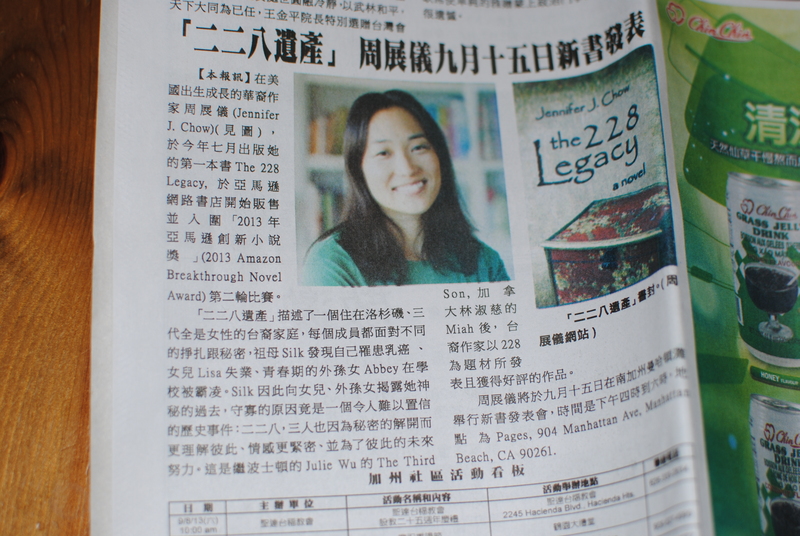 An article written in Chinese, detailing my book. Insight into my research and past Taiwan trips. More on the inspiration behind my novel. Five questions, including one asking about the elements in my novel dearest to my heart. I’m profiled on the Angry Asian Man blog. Find out what unleashes my inner tiger. Find out more about me as I answer the top questions you’ve always wanted to know, like my favorite dessert/snack or my most memorable conference experience.